Assistant Professor Teruyuki Niimi1 and Dr. Takahiro Ohde2 et al. have discovered that modern insects still possess, in different forms, the wing-like pads of fossil insects. Their paper was published online in Science Express on March 14, 2013, and in print in Science on April 26, 2013. 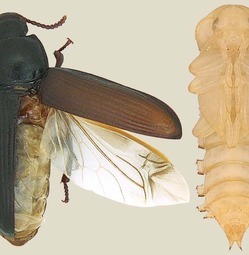 Modern insects only possess wings on the second and third thoracic segments, while wing-like structures might have originally appeared on all thoracic and abdominal segments in fossil insects. It was generally believed that those wing-like pads had been lost through evolution. A previous study showed that when the genes specifying segment identities are under repression, wing-like pads appear where they do not usually occur naturally in the insect body. This time, the group observed which parts of the insects would transform into wings with the genes inhibited. As a result, the protective structure on the prothorax and the projection structure on the abdomen developed into wings. This research shows that the genes essential for wing formation are also required for the formation of those structures, and that wings and those structures are homologous. The researchers have elucidated the fact that wing-like pads have been modified into different forms as time passes. This research has led to the discovery of the evolutionary development processes of insects. The number of insect species accounts for roughly half that of living organisms, and they have flourished the most of all living creatures. The main reasons for their proliferation are their acquisition of wings and their diversity. In the course of studying the evolutionary process of insect wings at the molecular level, we discovered how wings have been modified. This is one of the research outcomes we gained while studying the evolutionary development of wings and diversity in insects at the molecular level. "I would like to discover the molecular mechanism underlying the difference among wing serial homologues." "The observation of living nature can show you a variety of interesting phenomena. Why not study them with your own eyes, and enjoy the marvelous world of living creatures?" Copyright c Nagoya University. All Rights Reserved.